For a while now, there has been a certain type of necklace poppin’ everywhere. This is the collar necklace. Not just any necklace that wraps close to the neck, but those that actually look like a shirt collar. When I first saw it, I didn’t know how to feel about it. However, as I saw more styles and found inspiration on ways to wear it, I thought it was a fantastic idea! You can take a simple collar (I favor crew necks or necklines closer to the neck) on a t-shirt or dress and make it look more fun, interesting and/or fancy. No matter if you already own a piece or would like a new addition to your collection, here are some options to wrap around your neck and spice up any outfit. 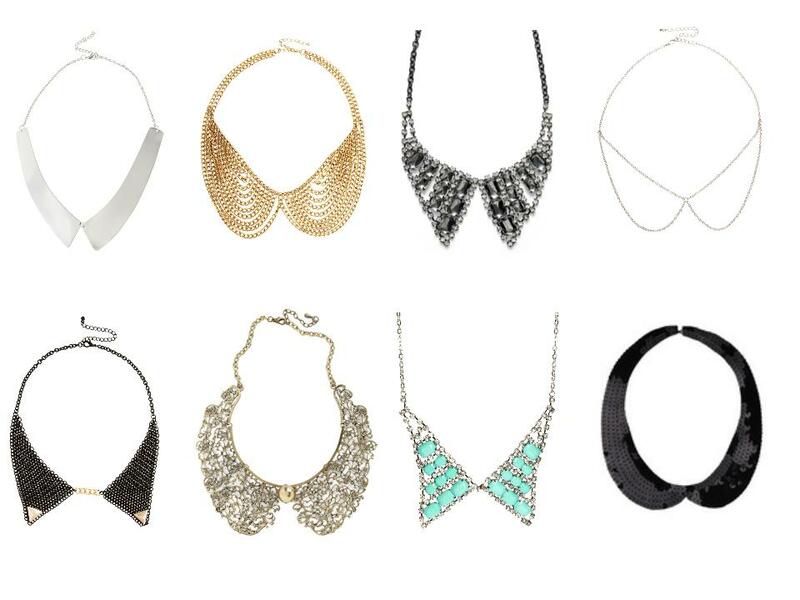 Do you like collar necklaces? I still haven’t jumped on board with this trend but I do really like them on other people. The first and second ones are my favorites! I love this trend! Such an easy way to spice up an outfit! I think the gold chain one from ASOS is my favorite. I like the idea of collars-as-jewelry more than the detachable fabric collars I am also seeing in stores.